On Sunday we decorated gingerbread houses. It’s a longstanding family tradition even though 50% of my children refuse to engage in it anymore. They loved it when they were little because they could eat all the candy they wanted while we decorated. They invited their friends over and it was a big gorge-fest. They also took pride in the actual decorating, because there was a little bit of competition to see who could make the most appealing house. Some years I baked the gingerbread from scratch. This was when Martha was preaching to us that we could duplicate our own house so easily with gingerbread, and I, like a lot of other suckers, fell for it. When you’re a hyper stay-home mom, you do these things. My friends and I, at one time or another, baked bread, make cakes from scratch, canned fresh produce, and took our kids to parks and parades and “outings” constantly. None of us have anything to show for it because our teenagers are as surly and ungrateful as the working moms’ teenagers, but I’m getting off the subject, which is gingerbread houses. I came to my senses and started buying those packaged kits; we assemble them now with a hot glue gun rather than the icing, which took forever to dry. No one eats the things – they rank side by side with fruitcakes as inedible holiday fare. Although one of our friends came over and started plucking candy off the roof of the gingerbread house one year. I had to slap his hand. Twice. Last year I was really thrifty and bought some g-bread houses on sale at half price to use this year. They weren’t the normal Wilton brand that I’ve used many years, they were a brand that stands for candy and has two names that both start with W and had a movie with the same names starring Gene Wilder first and then a remake starring Johnny Depp. I do not want to say the actual name because I’m afraid I’m going to get sued. This particular brand of g-bread house came in a very large box with lots of candies on the front. We opened the boxes and found them full of….(suspense!) green plastic molding that sequestered the candies into little compartments and had one small section for a baby g-bread house. Now maybe the makers thought this was a full size house, but that would be like saying a Barbie doll’s house was like a real house. Furthermore, some of the g-bread was cracked into pieces. That could have been from taking it out of the grocery cart and putting it into my storage area where it sat and did nothing for a year until it was removed from it’s safe place and opened. We got out the hot glue guns and went to work patching the sides so that we could assemble the houses. Once that was all done, they fell apart. There is some magical coating on these houses that makes them impervious to glue. By the time we got the houses to be freestanding, we were too tired to decorate. But we pressed on for the sake of tradition, and opened the bags of icing that came with the kit. My daughter squirted a little on her finger to have a taste, and it had a revolting brownish tinge. Luckily we had some leftover frosting from another kit and used that. The brownish color could have been because the icing was old, but I’m not so sure, I wouldn’t put anything past these guys. Anyway, we had pretty much lost interest in the whole affair by now, but we at least put nice roofs on the houses. 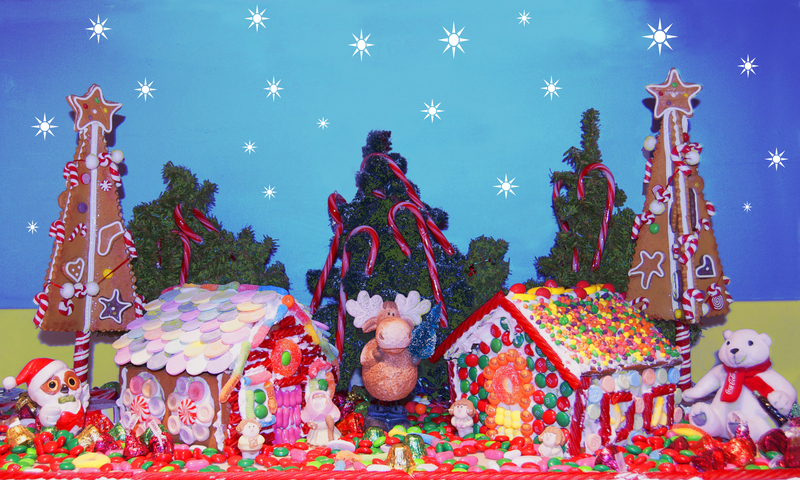 She used Necco wafers like shingles, and I sprinkled some of the colorful bits of hard candy that came with the kit on my roof. The rest of it we slapped together willy-nilly just to get them covered with candy and say we were done. One bunch of candies included in the kit were little yellow banana shaped things – now there’s a Christmassy color. Instead of nice greens and reds, everything was pastels or bright oranges. Luckily we always buy tons of red and green M & M’s and other seasonal candy to sprinkle around the houses to make them more festive. Plus the loose candy keeps most normal humans away from the candy on the house (except the one exception mentioned above). So that’s my tale of woe about this year’s gingerbread houses. I took a picture of them to put on my Christmas card, which for some stupid reason I think I have to make from scratch even though it takes hours and hours. I really need to see a psychiatrist. That will have to be one of my New Year’s resolutions. Along with not buying big suspicious boxes covered in candy just to save a couple of bucks. I Photoshopped the crap out of this to liven it up.